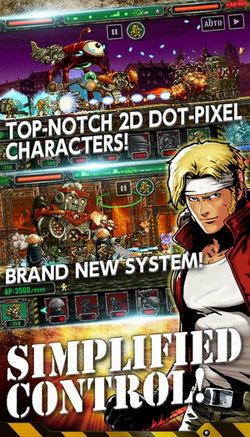 Gte back into epic 2D action with this latest installment in the legendary Metal Slug series by SNK. 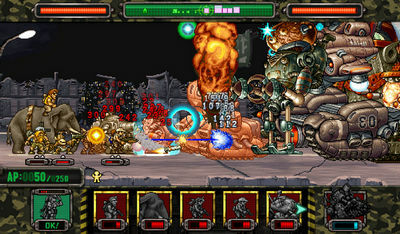 METAL SLUG ATTACK (hack) is a tower defense strategy where you have to complete various missions such as free military bases, rescue missions, treasure quests, etc. If you've played our hacked Metal Slug Defense then this one will feel more familiar. Except, this one is about Attacking enemies, not defending your base. Moreover, you get to upgrade and level up your units, then take your powerful squad online to defeat enemies. Different mission types such as: "P.O.W. RESCUE", "COMBAT SCHOOL" or "TREASURE HUNT" game modes. Install, Download data ingame (170+ MB) and play online. If you're more of a platformer-gaming kind of guy, then download Metal Slug 3 for Android and run, jump, and shoot Morden's army with all kinds of weapons.